October 2, Houston, Texas - Easygenerator has won the Golden Excellence in E-Learning award, one of the highest honors in the corporate learning space. This award is presented by Chief Learning Officer (CLO Media) for outstanding achievements in the corporate learning industry. Easygenerator won the award in recognition of its work implementing an innovative Employee-generated Learning (EGL) strategy at Nielsen. The global information and data company rolled out a new,company-wide learning methodology among 40,000 employees in 100 countries. Before partnering with Easygenerator, Nielsen's L&D team had been flooded with learning requests. The team needed to reduce its workload to be able to focus on strategic learning programs. By adopting Easygenerator and its EGL methodology, Nielsen employees were able to start handling learning requests themselves without sacrificing content quality. 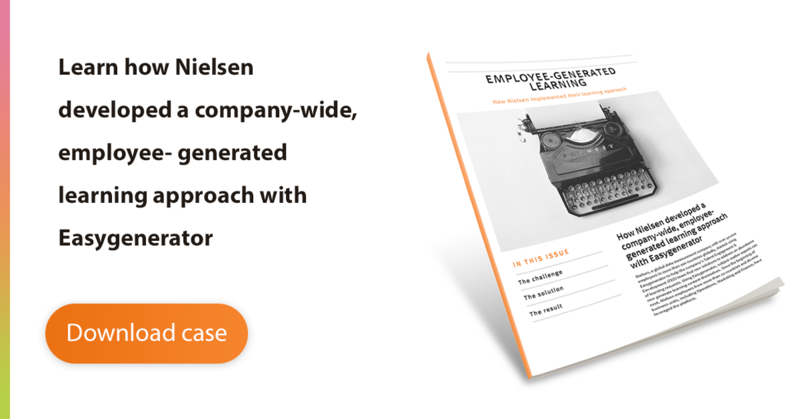 Nielsen employees quickly embraced Easygenerator to create courses, onboarding sessions, product training and work instructions for which they had previously relied solely on L&D. “For Easygenerator, this is a great recognition of the vision behind the EGL solution we offer within the corporate learning space. Nielsen was one of our first large clients who believed in EGL and had the innovative mindset in place to solve their user case together with us,” says Kasper Spiro, CEO of Easygenerator. Easygenerator has been providing cloud-based authoring software since 2013. Their easy-to-use platform empowers employees to quickly create their own engaging content, instead of having to rely on traditional training methods. The Rotterdam-based company has more than 50,000 users in over 150 countries. Its clients include companies like T-Mobile, Unilever and Kellogg’s. Easygenerator has experienced more than 100% growth each year since 2013.